With so many food choices, it's often difficult to know which foods are the most wholesome and healthy for your children. Kids' nutrition is important because it sets a lifetime precedent for making healthful choices. Feeding your children healthy foods also affects their health, helping them to avoid childhood obesity and its companion health problems. A healthy diet contains a balanced variety of micronutrients (vitamins and minerals) and macronutrients (carbohydrates, protein, and fat). This doesn't need to be complicated. Half of your child's plate at each meal should be filled with fruits and vegetables. The remaining part of the plate should be divided among healthy grains and lean protein, with grains taking up more of the plate than protein. 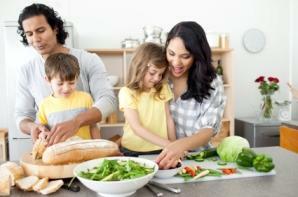 Make at least 50 percent of the grains you serve to your kids' whole grains such as brown rice or oatmeal. Add a serving of non-fat or lowfat dairy products with each meal. Replace sugary drinks with water. Healthful eating extends beyond determining what portion of your plate should be taken up by each food group, however. Healthy diets also control portions and include a variety of healthful foods. Shop around the edges of the grocery store, where you'll find produce, lean meats, eggs, and dairy products. Consider joining a community-supported agriculture program (CSA). These programs allow you to receive a weekly delivery of farm-fresh, seasonal fruits and vegetables. To find a CSA in your area, visit Local Harvest and use their searchable database. Get your kids interested in whole foods by growing some of your own produce. You don't need a full garden to do this. You can plant a number of fruits and vegetables in container gardens. Offer nuts and seeds as snacks. These foods are much closer to their natural state than other prepackaged foods, which may be filled with sugar, chemicals, and preservatives. Offer local, seasonal fruits and vegetables that are at the peak of freshness for better taste and nutrition. Allow your children to pick a "fruit of the week" or a "vegetable of the week" where they choose some produce that interests them and they haven't tried before. This can lead to the discovery of many healthful favorites. When you can't find seasonal fresh fruits and vegetables, opt for frozen over canned; the frozen varieties tend to have better taste and texture. Make fruits and vegetables fun by cutting them into kid-sized bites and providing some kind of a low-sugar, low-fat dip for them such as hummus or a sugar-free yogurt dip. Incorporate fruits and vegetables into delicious smoothies such as a green smoothie or a berry banana smoothie. Incorporate vegetables kids might otherwise avoid into their diet by grating them and adding them to sauces, soups, sandwiches and other foods. For example, grate zucchini and add to pasta sauce or add grated carrots to sandwiches. Make fruits and vegetables more fun by arranging and serving them in a playful manner, such as cutting them into fun shapes or arranging them into a clever critter on the plate. Visit farmer's markets with your children and allow them to choose fruits and vegetables that interest them. Instead of serving white bread for sandwiches and toast, choose 100 percent whole grain or sprouted grain breads. Replace white pasta with whole grain pasta. Make the switch gradually. For example, start by mixing equal parts of white rice and brown rice and then gradually increase the ratio until you are serving only brown rice. Allow your children to choose between a few different whole grains they would like to try. Let them choose from an array of healthy grains such as bulgur, barley, amaranth, millet, and quinoa. If your children are resistant to new grains, gradually incorporate them by adding a little to a processed grain your kids do enjoy, and then gradually increasing the ratio of the whole grain until you've eliminated the processed grain. Make homemade baked treats using whole grains. Offer oatmeal or unsweetened whole grain cereals for breakfast. You can make these cereals more interesting to your children by adding dried or fresh fruit and cinnamon and sweetening with a little stevia. Use whole wheat tortillas in place of white tortillas. Offer healthy snacks and engage your children in the preparation. While processed and fast foods are convenient, they are often less than healthy because they take the place of healthier, whole foods. These should be "sometimes" treats instead of mainstays of your children's diet. To minimize processed and fast foods, try the following tips. If you do offer processed foods, fast foods, and packaged foods to your kids, read labels carefully. Watch for foods that are high in unpronounceable chemicals, salt, sugar, and fat. Keep a supply of wholesome, healthy convenience foods on hand for when you're in a hurry. Healthy foods you might want to keep ready include prepackaged fresh fruits and vegetables, small boxes of dried fruits, nuts and seeds, low-sugar low-fat yogurt, and whole grain crackers. Check with your school about the foods they offer for your children's school lunch program. While many schools are making an effort to create healthier lunches for kids, others still have a ways to go. You may be better off packing a lunch for your children each day to ensure they get the healthiest foods possible. When you do opt for a fast food meal, balance out unhealthy items by choosing healthier sides. For example, if your child wants a hamburger, order a small hamburger with sliced apples or a side salad. Replace soda with lowfat milk or water. When you cook healthful foods, consider making extra and freezing it in individual containers for quick, convenient meals on the run. Make sweetened beverages such as soft drinks a sometimes treat - or eliminate them altogether. Replace sweetened beverages with water. Learn all of the names for sugar on labels, such as dehydrated cane juice, high-fructose corn syrup, fructose, sucrose, and many others. Watch for sugar content in healthy products, such as yogurt, as well. Replace sugar-sweetened yogurt with plain yogurt and fresh fruit. Instead of serving your kids juice, give them whole fruit or lower sugar in juices by combining half juice and half water. Make candy, cookies, cakes, and other sugary foods an occasional treat instead of a dietary mainstay. Replace pre-sweetened breakfast cereals with unsweetened foods such as oatmeal. Use whole fruits, spices, or stevia to add sweetness. If your kids eat a lot of sugar, reduce their intake gradually so they are more accepting of the change. If your kids are hooked on sugary soda, don't switch them to diet soda. Instead, add a little fruit juice to sparkling water. When you do offer baked treats, opt for homemade over processed. Homemade treats allow you to control the amount of sugar you add. In many cases, you can replace about half the sugar with fruit puree or applesauce. Teaching your children to make healthy food choices is a lifelong project that begins with their first bite of food. As a parent, you have a significant level of control over the food choices your children make - both in the foods you offer them and the example you set. By paying careful attention to what you teach your children about food from the earliest age throughout their childhood, you can set a precedent for a lifetime of healthy choices.